Delhi’s Mayapuri is home to the largest scrap market in Asia. The availability of cheap vehicle spare parts has made it popular amongst car enthusiasts looking to modify their own vehicles. This popularity is also enjoyed by the scrap markets of Kurla in Mumbai and Pudupet in Chennai. Kurla, in fact, is a favourite for taxi drivers in Mumbai – if you have an old car’s chassis and petrol engine, then you can get an entire car built around these parts. Mayapuri has been so successful that its annual turnover was estimated to be around INR 6,000 crore in 2010. But despite the joy you get from getting spare parts for cheap, you still end up paying a high price. There are no rules and regulations that lay down the procedures for sorting scrap, processing it or conditions that need to be maintained for safe disposal. Consequently, scrap dealers in these yards are usually careless about how they dispose of the waste products. Consider Mayapuri, the most notorious of all scrap yards in the country. There are very narrow alleyways, sewers that are pretty much non-existent, and the ground is almost entirely black due to decades of oil and various other substances seeping into it. The scrap dealers of Mayapuri are famous for stripping down cars quickly. But this speed is devoid of care and precision, as more often than not they ignore proper methods for draining the oils out of the car. Further, batteries from the vehicles are not carefully handled, and the acid often ends up leaking out. The oils can be processed and re-used, and there are better ways to handle the battery acid and its disposal. 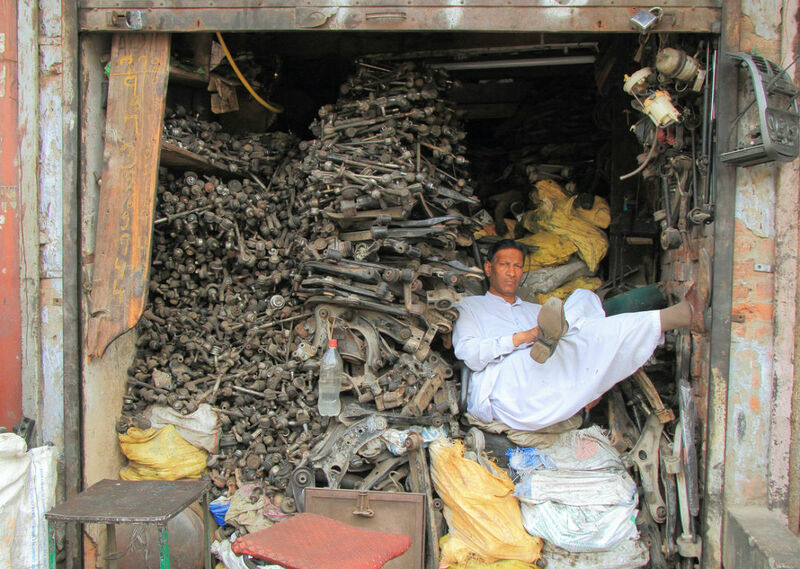 Similar scenes can be viewed in Kurla, as well as other scrap yards all over the country. The absence of legal compulsion has been problematic, and scrap dealers have not been bothered to consider environmental and health concerns. Profit has been the only driving factor here. Mayapuri was in the news for all the wrong reasons in 2010, as it was revealed that a radioactive substance, Cobalt 60, had made its way into the scrap yards. Five people fell seriously ill and one person died as a result. The entire locality went into panic. The radioactive substance was part of a Gamma Cell Irradiator, which had been lying unused since 1985, until a committee of eight DU professors decided to auction it. And the winning bid came from a scrap dealer. Consider that. But Mayapuri isn’t the only scrap yard with issues. Kurla too has been a regular feature in the news due to fires constantly breaking out. There has been no regulation or proper assignment of units for these places, and as such, hazardous substances can be seen piled high in the narrow lanes. While the practices in these places are unsafe for the environment, the detrimental effects can also be seen n the workers. While scrap dealers make a huge margin, their employees barely make enough to survive. These labourers ultimately end up with severe symptoms arising out of the unsafe working conditions. A walk through Mayapuri is enough to show you the unsafe manner in which scrap metal is extracted from a vehicle. Further, the unwanted waste material is not disposed of and simply lies here and there on the streets.